The club was first known as the "White Hart' Social and Sports Club, and actually cricket began at Adwalton in 1871.The White Hart was a coaching house where, it is reputed, Queen Elizabeth I once slept. It was situated where the old feast ground was at the bottom of Moorside Green. The aim and objects of the club was and still is to give the men and boys of the village an opportunity to enjoy cricket and to provide entertainment for those who are unable to play. The original club had 21 members who paid 2/6d. In 1874 Adwalton signed their first professional, a cricketer by the name of William Briggs "Bill" Foster of Morley. He was a square arm bowler and was paid a fee of 5s. per week plus rail fare on condition that he was available for all Saturday games. The following season he was given a rise of 2/6d and a further shilling the season after. Other professionals included bowler Jack Driver who hailed from Gildersome and was paid 6s. plus rail fares, and John Bedford Greenwood, Smith Walsworth, Ellis Sutcliffe and George Bedford. In 1875 the club changed its name to Adwalton Queen Elizabeth and also started a Second XI. From early records dating to 1899 it would appear that the star batsmen included George Roberts, Bob Render, Asa Horrocks, Sutcliffe Booth, Arba Rushworth, Willie Bedford and Tom Naylor, while the bowling strength comprised of James Henry Steal, Rufus Barker, Edgar Robinson, Jim Metcalfe and Nimrod Scott. The All-Rounders were players such as Willie Bedford, Tom Naylor, Edgar Robinson's brother Rufus and John Pitts. One of the biggest events of the year during these years was the Whitsun Gala that was a 3-day cricket game - Saturday, Sunday and Monday rounded off on Tuesday with a "shindig' that consisted of a sports day with beer and skittles. The refreshments included 2 sides of ham, a forequarter of beef (the dripping had to be saved to use for sandwiches), various ladies were even commissioned to bake over two stone of bread! 40 cases of ale as well as bottles of Port, Gin and Whiskey, 110 tickets in total were sold and only 4 glasses were broken in the day! In those days the two teams would decide on 11 men plus and 3 reserves and if both teams had a full complement on the day then they would play 14 a side. Another peculiarity of the time was that the home team captain and the away team opening bowler would choose which wicket to play on, and the home team captain would decide whether to bat or field! The club played in various local leagues, including one based in Dewsbury and another in Pudsey, but they struck gold during their era in the Gildersome and District League. In 1895 they were crowned champions and picked up their first major silverware as a club. Although Adwalton participated in the Heavy Woollen Cup they were hardly one of the leading lights of the competition. However, in 1901 in the 1st round, they cruised to victory, dismissing Birstall for 24 and winning by 10 wickets. Further success followed in the 2nd round with Cleckheaton, the victims, dismissed for 40 in reply to Adwalton’s score of 100. However, Cleckheaton lodged an objection to Adwalton playing J.H. Greenwood who had not played in seven qualifying games and had played nine games for Morley that season. Cleckheaton also alleged that the Adwalton ground was unfit, there being no proper boundaries and at several times their fielders were behind spectators who appeared to wilfully obstruct them. Adwalton admitted that Greenwood had only played five qualifying matches and the tie was awarded to Cleckheaton, who duly lost in the following round. In 1907 Adwalton performed the immense feat of going throughout the league season unbeaten, and in consequence winning the title for the second time. This obviously inspired the club to become founder members of the Bradford Central Cricket League in 1908. This had a more extensive membership and was deemed to be a better standard. In 1920 the club took the name by which it is known today - Adwalton Cricket and Athletic Club. The aim of the club was to stage half day, one day and holiday matches and in later years held single wicket challenges, galas, picnics, tennis tournaments, band performances, walking matches and even flower shows. Between the wars players who will long be remembered include Edgar Sykes, Tom Naylor (captain in the 1920's), the Child brothers, Ernest Lodge, George Johnson and Herbert Binks. Thoughts of building the sporting facilities resulted in new tennis courts and the start-up of an association football team. In the 1930's the Yorkshire Cricketer Emmott Robinson played at Adwalton. Although of elderly years for a cricketer it was a coup for Adwalton to have his services. In his first-class career, Robinson played in 416 matches, scoring 9,744 runs at an average of 25.50 with a highest score of 135*. He made seven centuries and forty eight fifties, and twice scored over a thousand runs in a season- 1,104 in 1921 and 1,097 in 1929, and also topped 900 on three occasions. Robinson was a renowned fielder who took 322 catches, and was also an effective change bowler, taking 902 wickets at 22.04. He took five wickets in an innings thirty six times and ten wickets in a match on five occasions. Jack Hobbs once said that Robinson was the best swing bowler he had ever seen. A less exalted Yorkshire player who played for Adwalton during this period was Billy Bedford who once represented his county at Bradford (Park Avenue). After thirty-one years membership of the Bradford Central League they won the 'B' Section title in 1939. Players in the forties and fifties include Jim Appleyard, Harry Shoesmith, John Roper, Jack Haley, Harold Webster, Alfred Elliott, Joe Oversby, Jimmy Ruglan, Arthur Stakes, Peter Heron, Stanley Brough Herbert Griffiths, Jack Kilvington and Sam Carter who all served the club loyally. 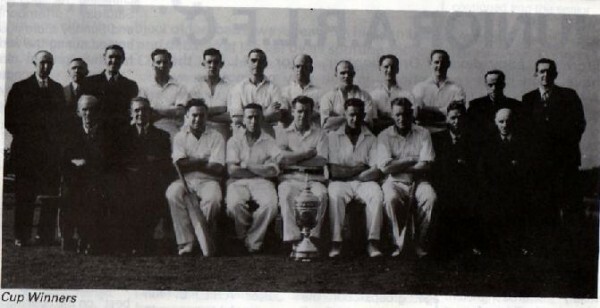 It was in 1945 when Adwalton really came of age winning the Waddilove Trophy for the first time- the league’s major cup competition. To complete the best period in their history they then won the 1946 First Division title in the following year. These early post-war years were their hey-day as a cricket club, but it would not last. In June 1949, Mr Brennan, who owned the field, was approached by the club to see if it could be purchased. A price was fixed at £500. Six trustees were appointed to purchase the field on the behalf of the Club and remain trustees until the loans were repaid. Several members offered loans of £10 and several more gave £1. About £170 was given in the meeting, three other members loaned the rest. In 1953 Mr Brennan was asked if he would let his horse on the field so it could "cut the grass'. Back in Division Two Adwalton found it difficult to sustain life in the top flight, and engendered a reputation as a yo-yo club. But, at least it kept the silverware flowing with two Division Two titles in 1954 and 1958 to keep their followers happy. In 1959 £50 was allocated to purchase Premium Bonds, presumably as a `safe’ gamble to raise future funds for the club. Although still in Division Two the club had a remarkable season in 1961 winning the title for the third time in seven years, but more importantly taking the Waddilove Trophy for the second time in their history.